Hey everybody, Waffles here - filling in for the Boss! I've found the PURR-fect gift for ALL your girlfriends! It's a pretty chiffon scarf from our friends at Triple T Studios. It's very, very special on account of it has CATS sprinkled all over it! According to Glogirly, that's even better than cupcake sprinkles! The scarf comes in three colors: light pink, beige and black. The cat silhouettes are stylish and sophisticated. ...uh, what's sophisticated mean? At only 2 ounces, they're light as air. The chiffon is silky soft and it measures a generous 70 x 160 cm. That's about 31" x 63". Glogirly's favorite is the black with beige cats. She's going to wear it with her denim jacket. It's special enough though to dress up for holiday parties. ...and dates with a certain orange mancat. At only $9.99 each, that's like just a couple of fancy coffee drinks... and much less messy to wear. 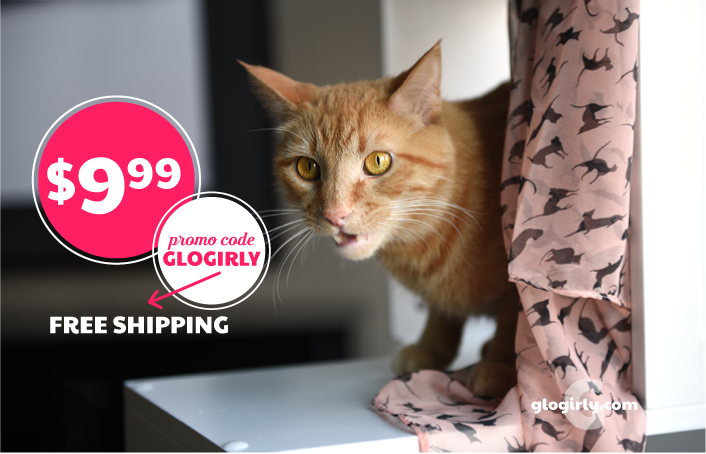 GLOGIRLY readers will receive free US shipping with their orders. Just enter the promo code "GLOGIRLY" in the promo code box at checkout and then click apply. The promo code box will appear on the screen after you enter your shipping and payment information. Your cart will be updated and free shipping will be applied. Then just click to complete the checkout process. Offer is limited and available only while supplies last. ... so you better get busy! 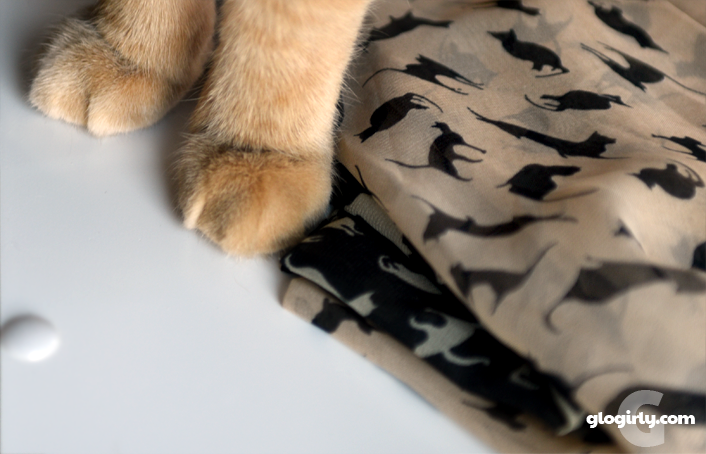 Three lucky GLOGIRLY readers will receive a Cat Print Scarf of their choice! Giveaway is open WORLDWIDE! Special thanks to Triple T Studios ...we're so thrilled they are able to include our Canadian and overseas readers. Good luck everybody! 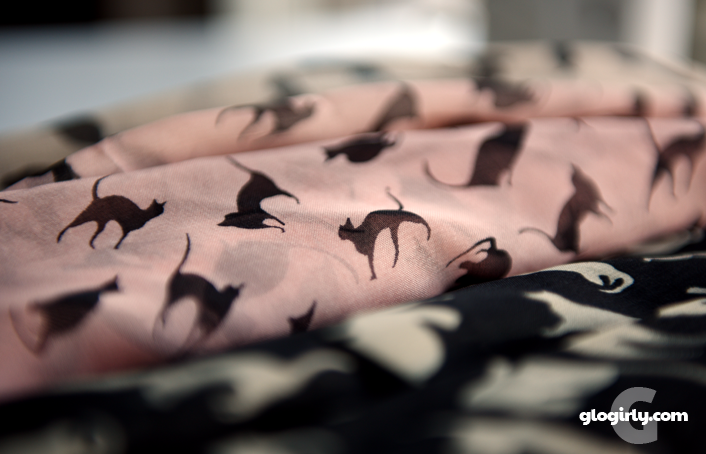 We received our Cat Print Scarves at no charge from Triple T Studios. Receiving the free product did not influence our article or anything we say. All articles on GLOGIRLY will always reflect our honest opinions. Those are really nice scarves! Maybe I will win one for my human. Wouldn't that surprise her? None of the other kitties have ever given her gifts, except maybe a hairball. I would like it for me 'cause I want to impress my boyfriend Waffles. For myself. I'm on oxygen and it would be perfect to cover my lower face with when I have to go outside this winter as I hate the knitted scarves...too hard to breathe through. Happy Birthday! Sending you purrs and headbonks. Our Mommy loves the scarf, too. It's darling and she says she can just see it on Glogirly. Adorable! Have a great Friday, sweet furriends. Joanne does good work and who wouldn't want a pretty kitty scarf? You did a pawsum job Waffles. Those awe sum gweat scarves. Sure hope we win one fur mommy. Hav a pawsum day. Gonna get one of these for my Mom! She's gonna love one of these scarves. I might even get one for me, since the price is so good. We LOVE it!!!!! We MUST get our mommy at least 1!!!!! Those are so lovely! Who wouldn't want one! I'd like to get for my grandma. Grandpa passed on earlier this year. We are concerned as she is visibly low in spirit. I hope to cheer her up with this purr-fect gift with her fa-purr-ite print. Wow we thinks we would give it to Mommy but her BFF since she was 4 would love it too. Fenris & Tui, say she is very nice and feeds them food off her plate when Mommy goes to the little girls room. And they reports that she feeds the cats at her office and that she is working with a rescue group to get the office cats TNR. So we thinks maybe she deserves it more than Mommy. I'm a sucker for anything with a cat print on it. I would love to win one! That would be a pawsome Christmas present for our Mom! We hope we win it!! I'd love to keep it for myself, but I think I'd give this to my oldest daughter if I win. She absolutely loves cats and this is something she'd definitely love - and wear. I love the pink scarf! Beautiful! Mom would love the black one. I would give it to my sister. She is so much more stylish than me--it would look awesome on her. Those are pretty! I like the black one too. What pretty scarves - Mum wants to keep it for herself if she wins and doesn't mind what colour it is. The scarves are so pretty. We would like to win one for Mom. She would look lovely in it. I'd love to win one for myself. I don't have many scarves to jazz up my wardrobe and I'm kindareally broke, so...and if they're good for dates with handsome mancats, it will be purrfect to wear when I cuddle up with my big white guy Sam. The scarf looks great on the denim jacket. I would love to win one for ME. Meowm would look great in one of these! Our mommy always wears black so we'd love to win this so she'd have some color and kitties in her wardrobe! You are such a great Spokeskitty Waffles..If it's good enough to wear on a date with you..I would love to win one..I like the black best too.. I'm with Glogirly, I like the black one. So pretty! Good luck everyone. Those are great, and they would make awesome gifts for a bunch of cat ladies we know! Very pretty! Waffles needs a orange one! That is a pretty scarf. Very pretty. I would love to win one for me. Thanks for the giveaway. I love scarves! I don't have one with cats on it. My mom has two cats so I would give it to them! I’d like to give it to my Aunt Pauline for Christmas. It doesn’t look warm enough for winter. You want the truth! It would be for me. I know tis the season and everything but some things you just have to keep for yourself. Despite the lack of leopard, these scarves are BEAUTIFUL nonetheless and I would love to win one! Oh what a lovely scarf!! Mommy would love a beige one. That's the color of her winter coat. She doesn't have a scarf, so this would be a very nice Christmas present. For my mama...she looks good in scarves! For a friend who loves cats. I can't believe Mum nearly missed this!! Apologies Miss Katie we are here to enter And Share!! I'd love one for myself but I know both my mom and daughter would really like one. You can't beat the price so theychill be perfect Xmas gifts and a treat for myself. These scarves are so pretty! 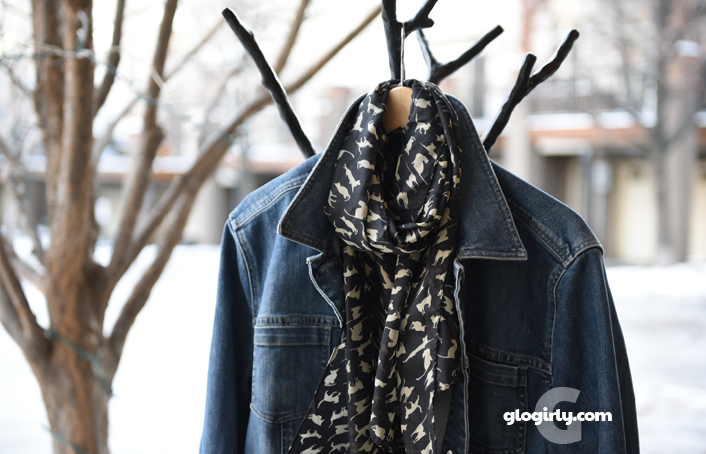 Glogirly's idea of combing one with a jeans jacket is genius! LOVE these. I would love the light pink scarf.....for ME! I am selfish. I would love this for myself! I'm such a fan of scarves and have been looking for a scarf w/ cats. This one looks so sophisticated. I love it! My sister-in-law would squeal in giddiness for one of these! I would love to win this for myself. Thanks! Oooh, we love the black one!! For our Mom! Those are so very cute! We would like to win it for our mom! The beige one with black cats is so pretty! Beautiful scarf and we'd love to win it. Thanks for the offer. I want to win one of these scarves for my wife. This would be hard to choose,who I would like to give to as a gift ...if I won.......daughter,granddaughter or for myself.hmmmmm ! This is pawsitivily lovely. I love cats and I would love to win this, so pretty! I would like to win for my friend who rescues and fosters cats. 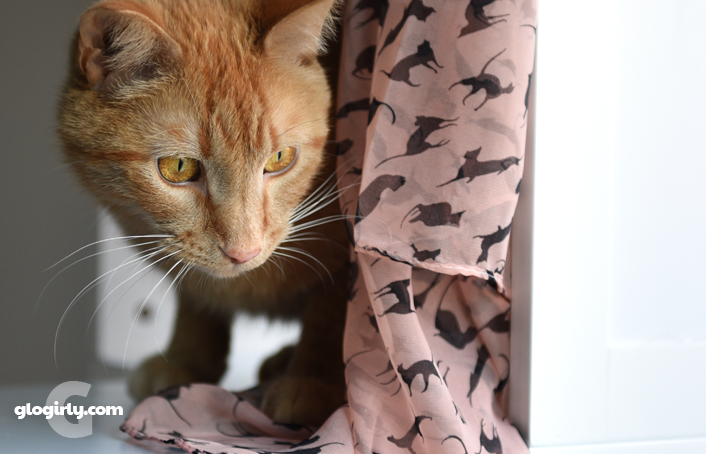 I'd love to win the cat print scarf for myself.